NEXT | What has everyone been doing while waiting for BFA? We have had a lot of story introduced in the past several weeks as a lead up to Battle for Azeroth. Between cinematics, novellas, comics, in-game events – it’s a ton of information to absorb. But all of these pieces are interlocked together in a pretty well-woven story, if you’re tracking things really closely. If you aren’t, it might be a little confusing trying to piece together what happened when, in terms of overall timeline. But hey – that’s what we’re here for. If you’re wondering where the in-game cinematics fit into novels and comics, or vice versa, we’ve got you covered. Let’s begin at the beginning, shall we. Or rather, the ending – of the Legion expansion. Please note: This post contains spoilers for the Battle for Lordaeron scenario released this week, as well as pre-expansion tie-ins like Before the Storm. If you haven’t experienced those yet, be sure to do so — especially the scenario, which will be gone next week. After defeating Argus, the Pantheon channels their powers to tear Sargeras away from our world. 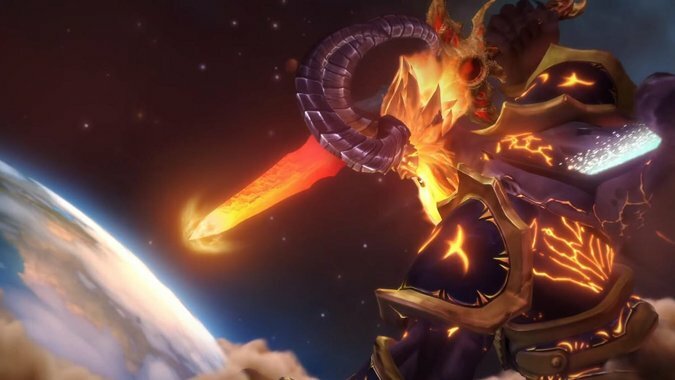 In one last-ditch attack before he is pulled to the Seat of the Pantheon, Sargeras summons his sword and plunges it deep into Azeroth – an act which leaves a gaping wound in the world. Just after the events, you can speak to the various NPCs scattered around the Vindicaar, who offer varying degrees of flavor text. In particular, take note of Alleria and Vereesa’s dialogue. Vereesa points out that the Windrunner sisters must meet, and she knows exactly where that meeting should take place. Sometime after their return to Azeroth, Alleria leaves Turalyon briefly to travel to Windrunner Spire – or what’s left of it. There, she and Vereesa are at long-last reunited with Sylvanas. They speak at length about what they’ve all gone through individually. At the end of the comic, it appears that Sylvanas was prepared to have her rangers murder her sisters, but called off the attack…for now. Before the Storm is the novel that takes place just after Three Sisters. 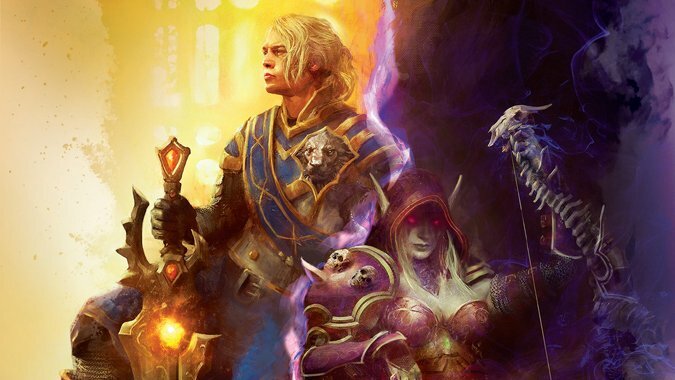 In the novel, Anduin comes up with a plan to try to reunite members of the Forsaken with their living kin, in an effort to forge some connections across faction lines and, hopefully, foster a little peace in the bargain. The plan turns to disaster during the arranged meeting, leaving Anduin with one conclusion: There was no sense in pursuing diplomacy with Sylvanas. Legion’s epilogue cinematics – Both Alliance and Horde have cinematics for when they receive word about what’s going on in Silithus. And both factions leap to action, which is played out via quests in-game and delved into with much more detail in Before the Storm. Magni has a plan for dealing with the dark energy emanating from Sargeras’ blade. It’s only going to take every Artifact weapon in our arsenal to get rid of. No big deal, right? Right. The events from this cinematic appear to take place after the events of Before the Storm – or they aren’t directly referenced in the novel, at any rate. But hey, how about that Azerite? It’s pretty great, and both sides want it. This all takes place simultaneously. The quests involving Ashenvale, Darkshore, and the eventual burning of Teldrassil all run their course throughout the novellas. Characters we speak to for quests and help out in-game are fleshed out in both novellas. 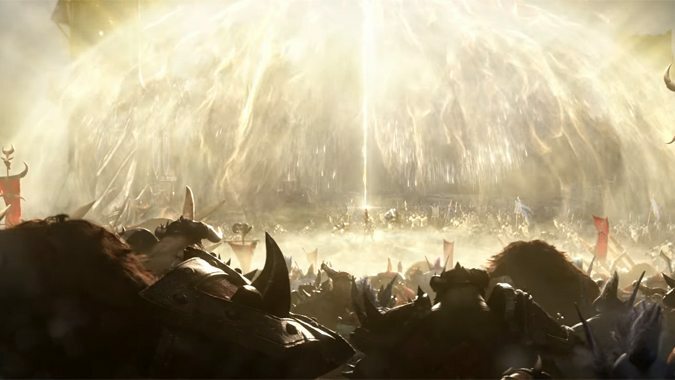 In A Good War, we see the attacks from the Horde point of view, and get a much closer look at the reasoning behind the war, and how Sylvanas’ leadership is being received by the Horde. Much of the novella is devoted to Saurfang’s perspective, although players may recognize the Blood Elf Rogue, Lorash Sunbeam – he’s the NPC you speak to when you’re sneaking into Astranaar during the Horde quest chain. In Elegy, we see the attacks from the Alliance perspective. Delaryn Summermoon is heavily featured here, and you learn a lot more about her backstory, and what she’s up to while we’re doing all those World Quests in Darkshore. There’s also a lot more detail given to the evacuation of Teldrassil, and Tyrande and Malfurion’s involvement in the proceedings. Alliance players, Rogues in particular, may recognize Renzik – he’s Mathias Shaw’s second-in-command, he was a quest giver in Lunarfall, the Alliance garrison, and most recently, he was a member of the Uncrowned during Legion. The events in both novellas and quests reach a horrific crescendo with this animated short. Sylvanas exchanges words with a dying Delaryn and orders the Horde to burn the World Tree. The events of this short are also mentioned at the end of both Elegy and A Good War, although the conversation between Delaryn and Sylvanas isn’t directly recounted. 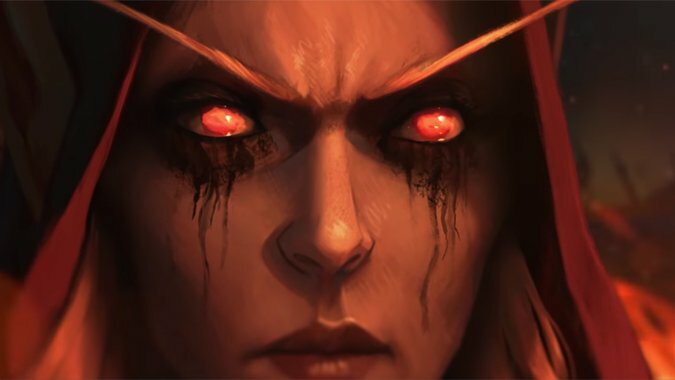 Saurfang’s reaction to Sylvanas’ orders, however, is covered in A Good War, and the Alliance events that play out in Darnassus are given more detail at the end of Elegy. Sometime after the events of A Good War, the Alliance has come calling to Lordaeron’s gates, as is only expected. 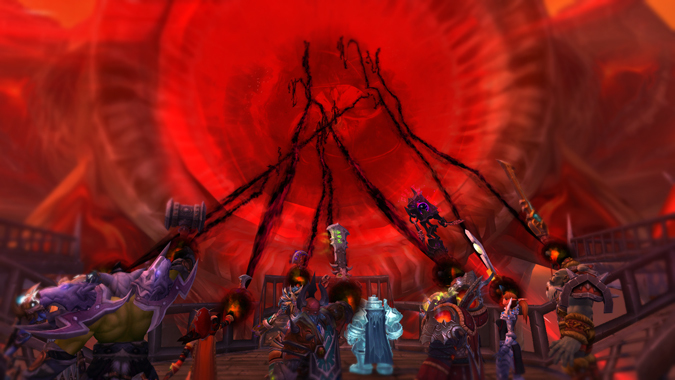 Saurfang is struggling with what he witnessed at the end of the War of the Thorns. 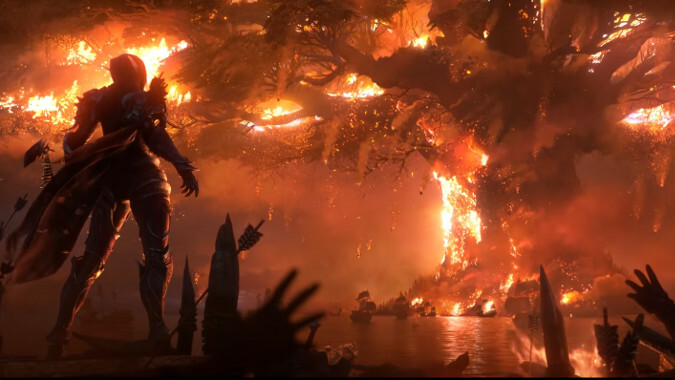 Sylvanas may have given the orders to burn Teldrassil, but the deaths of so many innocents rests on his shoulders as well. In the end of the cinematic, dawn breaks over the battlefield, and the Alliance begins their assault as Saurfang hastily prepares for battle. The introductory cinematic for Battle for Azeroth takes place immediately after Old Soldier – it’s why Saurfang isn’t decked out in full armor during the cinematic. This is the Battle for Lordaeron, the introductory scenario for Battle for Azeroth – which we can now play through in-game. All of these events culminate in the cinematic at the end of the Battle for Lordaeron scenario. There are two cinematics available here — one for the Alliance, and one for the Horde. The Alliance and Horde have engaged in all-out war…but if either side is going to win, they’re going to need allies to strengthen their numbers. And with that, we’re at a big to-be-continued in Battle for Azeroth next week! 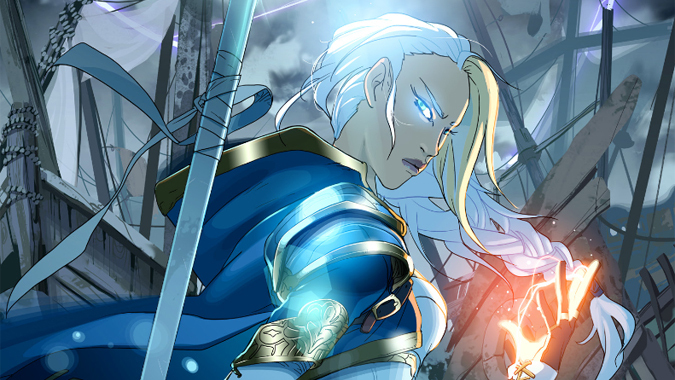 But hey, you’re wondering…where does Jaina Proudmoore fit into all of this? Jaina’s got her own timeline that works right alongside everything else going on in game. She’s off by herself for the majority of it, so she gets her own section here. In Before the Storm, we see Jaina briefly make a return to Dalaran, where she regretfully informs Kalecgos that she is not returning to the Kirin Tor. We learn that she’s been fighting demons on her own during Legion, after abruptly leaving when her protests against working with the Horde are summarily dismissed. The Burning Legion may be defeated, but Jaina is still looking for her own answers – who she is, what she’s looking for, what her life is meant to be. She leaves Kalecgos in Dalaran and takes a portal elsewhere. That elsewhere is the ruins of Theramore, where her world crashed around her not once, but twice. There was the destruction of the city, of course, but before that, there was the death of her father. After some soul-searching, Jaina decides to make a trip back to a place she hasn’t been since she was a child – Kul Tiras, her home. There, she discovers more about her past, and more about how Kul Tiras and its citizens view her. In the end, she returns to Theramore – and in the corner of the last panel, a familiar necklace glimmers. The first installment of Warbringers begins just after Reunion, with Jaina examining that same necklace and singing a song from Kul Tiras – a song about her. And as Jaina reflects on what she’s done, she makes a trip to the seas just beyond Theramore’s shores. There, she raises a sunken ship from the waters – her father’s vessel – and resolves to heed his words at long last. From Theramore to the Eastern Kingdoms, Jaina travels on that ship and makes a well-timed, suitably dramatic entrance at the Battle for Lordaeron. There, she assists Anduin, Genn, and the Alliance forces as they assault the Forsaken capital. 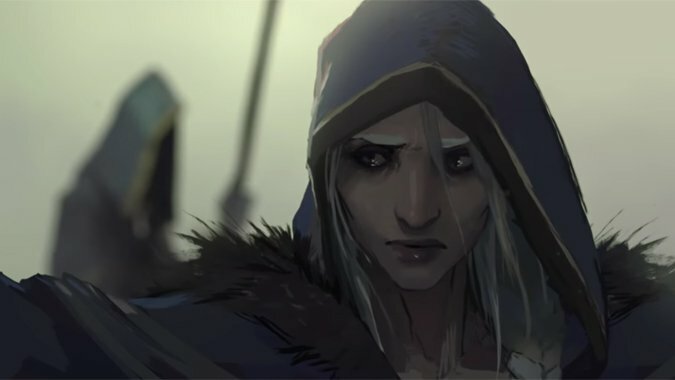 In the end, the war is far from over…but Jaina does have some potential allies in her back pocket, should she wish to reach out to Kul Tiras for aid — if they will even listen to her. This story, however, will also have to wait with a big to-be-continued until Battle for Azeroth next week! Blizzard’s done an excellent job here weaving stories together both in-game and out with cinematics, shorts, novellas, and even one big novel. You aren’t exactly missing anything if you don’t want to read the additional material, but there’s a lot to be gleaned from absorbing it all in turn. This is easily one of the most involved, intricate, and deftly woven introductions we’ve had to any expansion – I can’t wait to see what Battle for Azeroth has in store as the story continues.